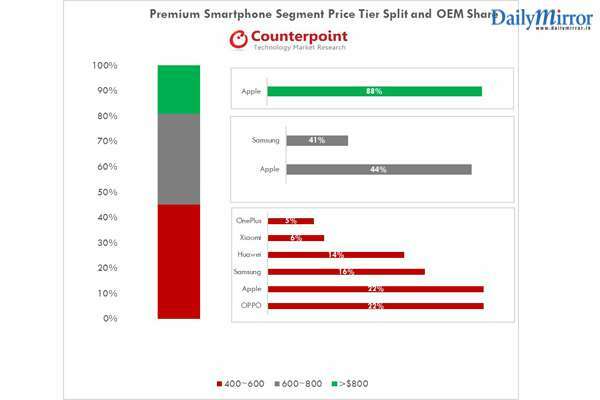 OPPO has been named as the leading smartphone brand by market research firm Counterpoint in the lower premium segment. The impressive result proves the brand is thriving amongst fierce competition in a largely saturated market. Furthermore, with more than 95% of flagship sales coming from the domestic Chinese market, its clear OPPO has ample opportunity to grow its share and thus bring more beautiful smartphone products to young consumers around the world. The Counterpoint report concluded that the global high-end smartphone market grew by 7% in the second quarter of 2018, with excellent performance in high-end product shipments. OPPO accounted for 10% of the overall premium smartphone market and in the $400-600 price segment, OPPO ranked first with 22% market share, followed by Apple, Samsung, Huawei, Xiaomi and others. Within the hugely important Chinese high-end smartphone market, the world’s largest, Apple ranked first and OPPO ranked second. Chinese smartphone manufacturers have “upgraded” their flagship products this year and OPPO has been at the forefront. The newly launched Find X has won unanimous praise from consumers and the media after a highly successful Paris launch. Not forgetting the company’s R series, which reinvigorated the industry at large with metallic colors and glass gradients as well as the latest launch of the flagship model OPPO F9 which sports VOOC flash charging and a multi-gradient colour body. In 2018 alone, OPPO has introduced several innovative technologies including the Super VOOC flash charging which allows more than two-hours talk time with mere 5-mts rapid charge, the panoramic arc screen, AI-enhanced 3D Camera, TOF and 3D structured light technology. OPPO has also inked partnerships with Stanford University on AI and internally, successfully tested 5G for use in the future development of 5G smartphones. In recent years, OPPO has put tremendous effort into manufacturing and hardware development with investment in R&D and Design centers around the world. In software, the company’s ColorOS continues to offer users a fast, smooth and intuitive experience. Both of these are exemplified by our number of applied technology patents, which has reached more than 32,000 globally. So far, OPPO had entered more than 30 countries and regions and operate in more than 400,000 stores. In marketing and retail, OPPO continues to speak to its target audience of young consumers through numerous partnerships in sports, fashion, movies, gaming and other spaces in popular culture. OPPO had already partnered with FC Barcelona, India’s National Cricket team,Victoria’s Secret Fashion Show and America’s Next Top Model. In each of these, young users have been successfully reached and shown how the mobile can complement their lives. It’s has been a winning strategy for OPPO in terms of making the brand appealing to more and more people. One of the fundamental goals of OPPO has been to adhere to the ‘art of technology’ and meet user needs.